Tennis partners Amanda Nord and Charlotte James spent the weekend together in Hershey, Pennsylvania, and came home with more than a pocketful of chocolate. 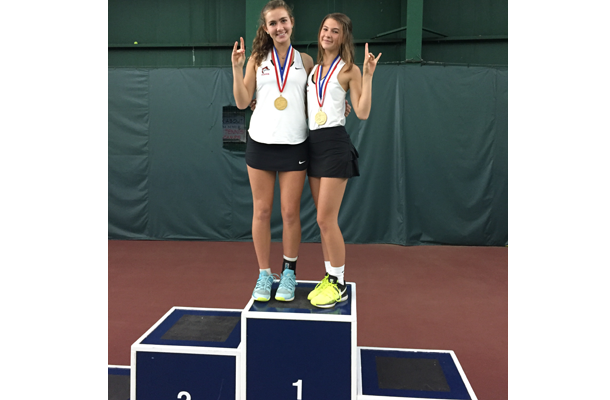 Even sweeter, they returned to the Fox Chapel Area as repeat PIAA AAA doubles tennis champions, and with Amanda’s third state gold medal in three years. While this is the second go-around for senior Amanda and sophomore Charlotte as a duo, Amanda has made the trip to Hershey Racquet Club twice before. As a freshman she and Laurel Shymansky were the PIAA runner-up, and then the following year they won the title outright. The only other female doubles player with more state titles is Moon High School’s Kelly Deep, who won four times between 1983 and 1986. Kelly also was the WPIAL’s first four-time doubles champion, but after 34 years of going unchallenged; Amanda matched her record this season. Before Amanda, a senior, and Charlotte, a sophomore, could claim another PIAA title, four teams were hoping to thwart their efforts. In the first round, the Lady Foxes faced Dina Nouaime and Tina Rice of Methacton High School and beat them 6-2,6-2. In the quarterfinals they overpowered Hollidaysburg players Jenee Delerme and Veronica Helsel, 6-0, 6-0, and then in the semifinals, they had a strong win over Central Bucks East partners Syndney Lund and Haylie Laff, 6-1, 6-2. While Amanda, a James Madison recruit, and Charlotte felt some pressure this year because of what was at stake, they overcame those jitters early and at the end of the day beat Pine-Richland’s Melissa Vizardo and Alyssa Sarver of Pine-Richland in the final match, 6-0, 6-4. Amanda concludes her high school years with a doubles career record 47-1. Her only loss came in the PIAA finals in her freshman year. She is 74-15 in singles and ranked fourth among all senior girls’ tennis players in Pennsylvania. Charlotte has an undefeated two-year career record in doubles of 24-0, and is 40-6 in singles. She is ranked third among all sophomore girls’ tennis players in the state.